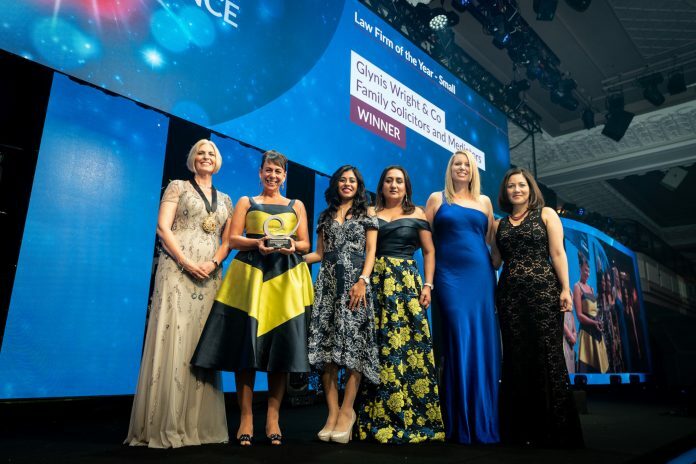 A growing Leicester family law firm has beaten off national competition to scoop one of the legal profession’s most prestigious awards. Glynis Wright & Co Family Solicitors and Mediators has been named Law Firm of the Year – Small at The Law Society’s Excellence awards. The judges were impressed by Glynis Wright & Co’s rapid growth from a sole practitioner firm to Leicester’s leading family law service provider and their innovative strategy of involving school children in short films focusing on the impacts of marital breakdown. Glynis Wright & Co was also recognised for its dedication to community charities, staff development and for developing the business to offer an integrated client care package. The Law Society’s Excellence Awards are considered the highest accolade for law firms in England and Wales. Head of Practice Glynis Wright said: “We are absolutely thrilled to have won this superb award. It is an amazing achievement for our wonderful team to have been chosen from so many firms nationally as a leading light in legal service provision. “We launched in Leicester seven years ago and are now one of the most significant providers of family law in the Midlands. I think what makes us stand out is that we place a huge emphasis on dispute resolution and conflict management, recognising the need to reduce the impact on children in a family breakup wherever possible. President of The Law Society of England and Wales Christina Blacklaws said: “Every year law firms and solicitors from every corner of England and Wales support their clients through major life events or particularly trying times. “Solicitors are here to help, and Glynis Wright & Co have shown their dedication over the last year through their development of an innovative project to support their clients about the impact of family breakups.